1. Dodd-Frank rollback: The US Congress on Tuesday approved a bill aimed at loosening regulations covering thousands of banks. The financial crisis era rules -- called the Dodd-Frank Act -- were designed to make banks safer. The bill will provide smaller financial institutions with relief from the strict rules that apply to Wall Street banks. Its passage marks the end of years of lobbying by the financial industry to softening the post-crisis rules. President Donald Trump is expected to sign the legislation before Memorial Day, according to a senior White House official. 2. Zuckerberg upsets the EU: Mark Zuckerberg met with members of the European Parliament on Tuesday, and again apologized for Facebook's (FB) mistakes. But the Facebook CEO mostly angered the lawmakers by dodging questions about the company's data collection practices, including the information it gathers from people who don't use Facebook. The lawmakers suggested Facebook might be a monopoly and questioned whether it should be broken up. 3. M&S profits plunge: Shares in British retailer Marks & Spencer (MAKSY) jumped 5.5% early in London, despite a 62% drop in annual profits. The plunge reflects the cost of closing more than 100 stores across the United Kingdom, as the company tries to encourage its customers to shop online. Investors are hoping the transformation will make M&S better at competing against online stores. M&S has had a rough ride -- its stock has lost 20% in the past 12 months. 4. Emerging markets pain: The Turkish lira plunged 5% against the dollar on Wednesday, taking its losses so far this year to 22%. The lira is suffering from worries about Turkey's economy, fears that politicians will meddle in monetary policy, and a broader trend of investors moving money out of emerging markets and into the United States. "Brazil, Argentina, Mexico, Turkey, Russia, and Indonesia are the countries that have experienced the largest selloffs in their currencies and, or, have raised interest rates," said William Jackson, senior emerging markets economist at Capital Economics. Argentina was forced to seek an IMF bailout in earlier this month. 5. Global market overview: Markets across the world were suffering losses early on Wednesday. 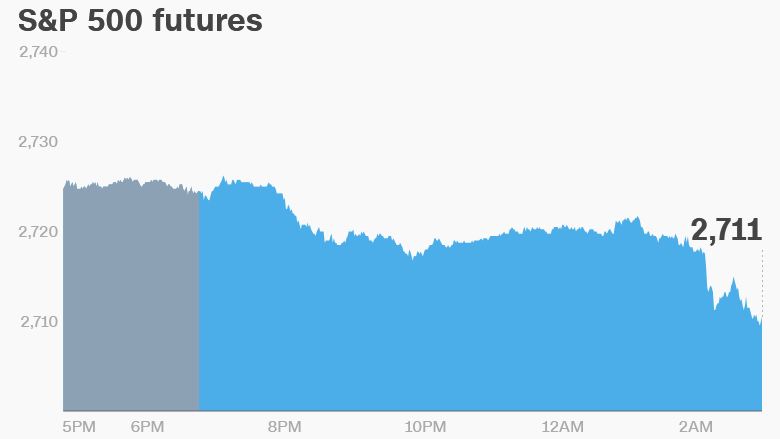 US stock futures were pointing lower, while major markets in Europe and Asian were also down. The Dow Jones industrial average dropped 0.7% on Tuesday, sinking back below 25,000. The S&P 500 was down 0.3% and the Nasdaq shed 0.2%. 6. Earnings and economics: Lowe's (LOW), Ralph Lauren (RL), Target (TGT), and Tiffany & Co (TIF) are set to release earnings before the open Wednesday, while L Brands (LB) and Williams-Sonoma (WSM) will follow after the close. The Federal Reserve will release minutes from its May meeting at 2 p.m. ET. The central bank left interest rates unchanged, but investors will be hoping for more indication of how many rate hikes to expect this year. The Commerce Department will report the number of new homes sold in April at 10:00 a.m. ET on Wednesday. New home sales surged to a four-month high in March.